There are certain aspects of Paris that have always captured my imagination, most of them in some way related to literature. The French Revolution, for example, fascinates me, a fact I trace back to middle school when I read Dickens’s A Tale of Two Cities. Charles Darnay, Sydney Carton, Madame DeFarge and her nasty band of peasant rebels all made Paris seem real to me long before I had an opportunity to actually see it. Then, Victor Hugo’s Hunchback of Notre Dame and Les Miserables added to my panorama of Paris. From Victor Hugo, fast forward to the Jazz Age of the 1920s, when artists and writers swarmed to Paris like bees to honey. 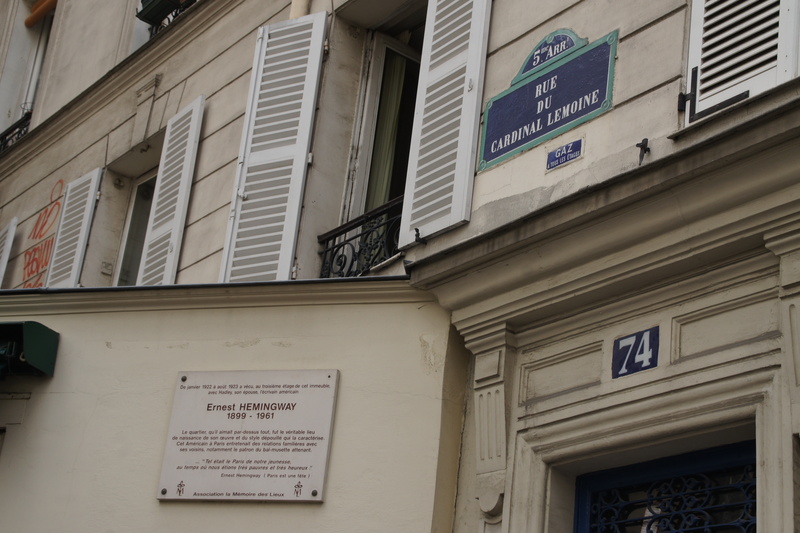 If you saw Woody Allen’s Midnight in Paris, you have a feel for the era when American expat writers such as Hemingway and Fitzgerald lived in Paris but seem to spend more time carousing than writing. That was about 90 years ago, but you can still see most of the places that Hemingway describes so beautifully in A Moveable Feast. The book is a virtual guidebook to the places he found most remarkable when he lived in Paris with is first wife, Hadley in the 1920s (and with subsequent wives later on). The story goes that, in the 1950s, a trunk full of notes on his first years in Paris turned up at the Ritz Hotel. That gave him the raw material to write A Moveable Feast. So, take a little stop at the Ritz, near the Place Vendôme, especially at the hotel’s Hemingway Bar. During the Liberation of Paris in 1944, Hemingway considered it one of his first duties to “liberate” the Ritz bar and order martinis all around. Here at the Ritz, Hemingway asked Mary Welsh to become his fourth wife. The hotel is closed for renovations but will open this year. CoCo Chanel lived at the Ritz and one of the rooms in the Imperial Suite re-creates one of Marie-Antoinette’s rooms at Versailles. This apartment is where Hemingway wrote The Sun Also Rises, the book that made him famous. Below it is a shop that used to be a bal-musette or dance hall. It appears in The Sun Also Rises as the bal where we first meet Lady Brett. (Rest assured, you don’t have to live like a starving artist in this neighborhood. If you can book far enough ahead, try the Hotel D’Angleterre where Hemingway once stayed.) Wander Place Contrescarpe, a rough old square packed with cafes and apartments that couldn’t have changed since the 1920s. 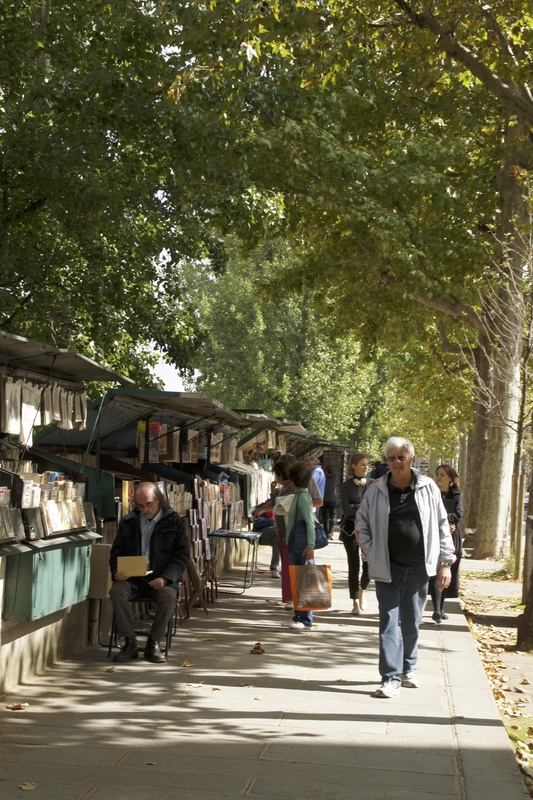 Take a morning stroll through the Marche Mouffetard (prime time is Saturday and Sunday morning), a fantastic market with produce, cheese, wine and just about anything you’ll need for your own feast, a picnic by the Seine or in the nearby Luxembourg Gardens. Strolling among the bouquinistes along the Seine in Paris. 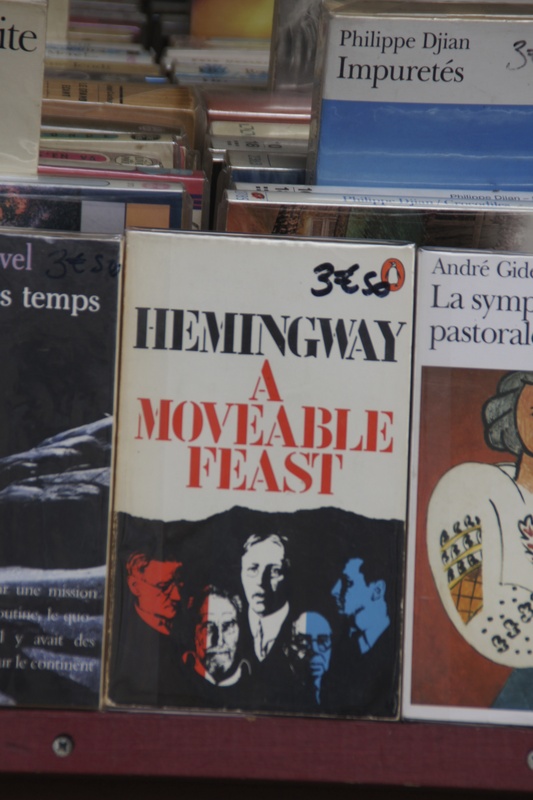 Hemingway might be surprised to see his book “A Moveable Feast” among the books sold by “bouquinistes” in Paris. You won’t feel lonely in any of the many famous cafes along Boulevard du Montparnasse, either. Okay, they’re pricey and popular with tourists, but worth it if you want to sample jazz age cafe life. The Closerie des Lilas, for example, at 171 Boulevard du Montparnasse is a lovely cafe where Hemingway wrote and Scott Fitzgerald read him The Great Gatsby. La Coupole, at number 102, is a vast art deco brasserie, brightly painted by Brancusi and Chagall.